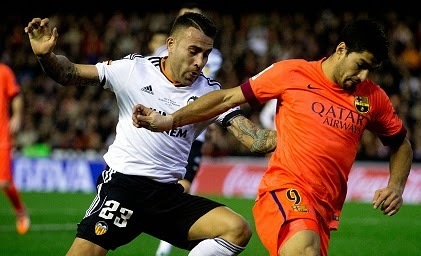 Manchester United eyeing Nicolas Otamendi Manchester United boss Louis van Gaal has now shortlisted another centre-back, Nicolas Otamendi of Valencia, as per the Spanish reports. Manchester United boss Louis van Gaal has now shortlisted another centre-back, Nicolas Otamendi of Valencia, as per the Spanish reports. The reports believe that the Premier League side Manchester United have offered around £27million despite of knowing the price tag put up by the Spanish side. Valencia have demanded atleast £32million. Few days ago it was reported strongly that Mats Hummels is set to join the Red Devils but with the interest in the Valencia star means that Hummels’ deal is still in the pipeline. The 26-year-old who scored the winner against Real Madrid earlier this month joined the La Liga side from Porto last year, his buy-out clause on contract is £32million. Eliaquim Mangala and Otamandi were one of the best defensive partnership at Porto last season. Mangala joined Manchester City and Otamandi is now set to follow his friend. The Argentina international would made his mind for a move as Manchester United are in urgent need of a centre-back. Daily Maile reported that the bid has been rejected and United are planning for a £30million bid which could be accepted by the La Liga side if the player forces for a move. He is a regular player for Valencia, has made 18 La Liga appearances so far this term.